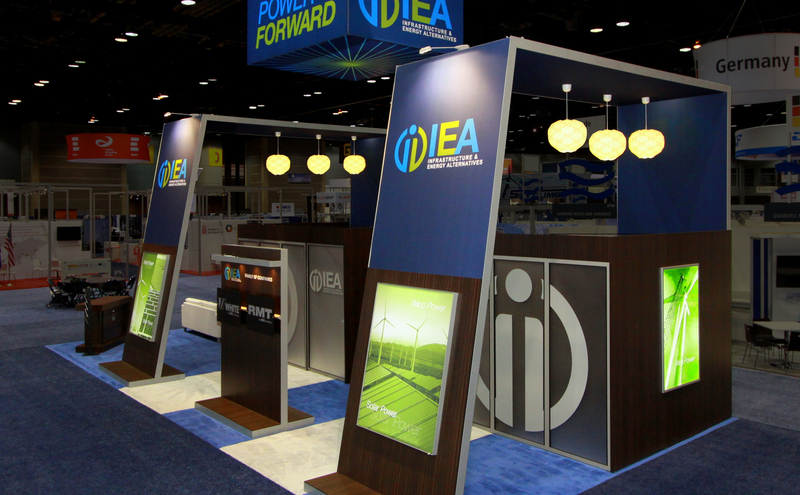 While backwalls are usually about 8 feet tall, that’s rarely the height of an island trade show booth. Most islands are at least 12 feet tall, and are often 16 feet and taller, and taller still when you hang a sign from the ceiling above your booth space. That height creates a bigger impression and gets you seen from afar. And, you can use 100% of that height, unlike backwall exhibitors (in the USA) who can only go to their full 8 foot height when it doesn’t obstruct their next-door neighbors. However, be careful not to only put your name up in the rafters on a hanging sign 20 feet above your booth, so that people walking closer to your booth won’t know who you are unless they (very unlikely) crane their necks to look up. A 20 x 20 foot island exhibit has 80 feet of aisle space, twice the aisle space of an equivalent-sized 10 x 40 backwall. That gives you twice the opportunity to engage attendees as they walk by your booth. Just be conscious that since your exhibit doesn’t back up against a pipe-and-drape backwall, it no longer has an automatic front side. Now your exhibit can be seen from 4 sides. It’s up to you to decide if all sides should be treated equally from a design standpoint, or if you expect one or two sides to be visible to greater traffic, and thus be designed more as the “storefront” of your exhibit. When you get an island exhibit, it’s usually not one-size-fits-all. At one show you may only be able to get a 20 x 40 foot space where you want it on the show floor – and then at your next show, have to take a 30 x 30 foot space, and still use the same exhibit components. Just as likely is the need to peel off parts of your booth for either a smaller island or a 20 foot backwall exhibit. Your island trade show exhibit needs the flexibility to adapt to all these spaces if you are going to avoid excess spending to fit all those booth sizes. Whatever you do in a backwall exhibit is there for the world to see. But island exhibitors can free themselves from that restraint. With opaque walls and even double decks, island exhibitors can host private meetings that allow them and their guests to converse, negotiate, and make deals with abandon. Exhibitors can show off their latest new products (especially fashion-driven products) only to their trusted buyers, without tipping their competitors off. When you have a backwall display going to 5, 10, 15 or more shows a year, it makes perfect sense to own that display. But when you only go to one or two shows a year where you require a larger presence with an island exhibit, you become more likely to choose exhibit rental. Rental gives you the ability to change your look, booth size, and message more easily than an owned exhibit does – and at a lower cost if you only do one or two shows a year. Not only do island exhibits have greater height, more aisle frontage, and multiple booth spaces to fit, there are other reasons that make their design process even more complex. Island exhibits will inspire more stakeholders to want a say in the design process. You’ll have more functionality requested (presentations, product demos, conference rooms, lead stations, storage, and more). So island exhibits require more of another thing: time to get designed and built. You need more booth staffers to cover and work an island exhibit. That can mean getting staffers from all over the country, or from more departments of your company — which puts even more emphasis on booth staff training. When the booth staff comes from all over, you’ll either have to train them with teleconferences or video conferences, or set aside enough time at the show site before the show starts. Staffers who don’t know the products or your clients well will need even more training to shore up their gaps. Skyline got its start in the 1980s by making it less expensive for exhibitors to install their own 10 foot exhibits with attractive displays that set up in minutes without tools. However, for over 20 years we have also been making island trade show exhibits that do require tools, ladders, forklifts, and most of all, hired labor. While some exhibitors are willing to set up our more modular (and less portable) inline exhibits, once you are in an island booth space, it’s all about either labor from the show contractor or from an Exhibitor Appointed Contractor (EAC) that you choose. It’s a lot more likely that your CFO will want to be more involved when you purchase an island exhibit than a banner stand. As island exhibits can cost many times more than a backwall display, the purchasing process involves more people and greater scrutiny. 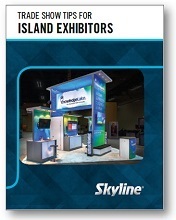 You will have to justify both your island exhibit’s initial buying (or renting) decision and the total operating costs, compared against the opportunities at trade shows to build your brand awareness, profitably generate sales leads, and meet your other sales, marketing, and operational objectives. While these 9 things make island exhibits different from backwall displays, no matter what size they are, your exhibits must still get attention and support your booth staff. That’s something that never changes!